What is the language C? There are various reasons to use the computer programming language C. For one thing, the popular C# and C++ have been developed out of the language C. So, what is the language C? It is a programming language used for computers. It can also be used for website programming as well. Generally, its function is to make operating systems, databases, modern programs, and more. Why should I use the language C? There are plenty of reasons to begin using or learning the language C. For one thing, it’s easy to learn. Also, it’s a compiled language; so you write the program, and then you have to put it through a compiler. That way, the computer can run the program. 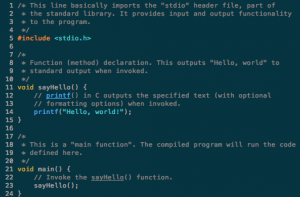 One benefit to C is that it can be compiled on various platforms. This widely-used language is also very influential. Many languages have been influenced by C for their own code — including C#, C++, Java, PHP, and Python. C was developed by Ken Thompson and Dennis Ritchie as the programming language for the Unix operating system. Development began in 1972 for the code. A book/manual written by Ritchie and another developer, called The C Programming Language came out in 1978. During the ’70s and ’80s, different versions of C were released and used for minicomputers and microcomputers. IBM began using C as well. C99 was developed in the late 1990’s. Out of that came C11, which was completed in 2011. 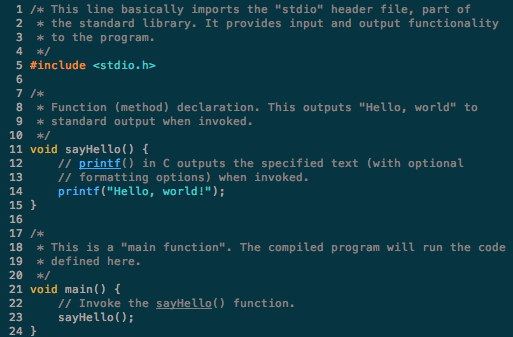 This version of C added more features to the code, and improved its compatibility with C++. So if you want to be a computer programmer, the language C is great to learn. It is generally taught in college to computer science majors, along with C# or C++. This language is widely used and it gives programmers a lot of control over their work. Knowing this language will definitely give you a boost in the professional world. « Tips for a Successful E-Commerce Business	» What are Breadcrumbs in Web Design?